Ninety-four-year-old Howard Smith is the baby of the family. At 97, his older sister has three years on him and still lives alone in San Francisco. “She’s a widow and I’m a widower, and we still have our own homes,” says Smith, who has lived in Oakland since 1949. But good genes (his mother died at 98) are only part of Smith’s secret to longevity. He works several days a month as a docent on the USS Potomac, President Franklin Delano Roosevelt’s “Floating White House” docked at Oakland’s Jack London waterfront. 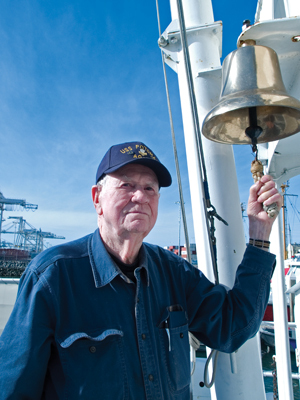 “I love to talk to the guests who visit the ship,” says Smith, who served in the Coast Guard during World War II. “Of course, I didn’t serve on a ship as nice as the Potomac,” he laughs, as he lovingly runs his hands down the shiny brass rails of the presidential yacht. When Smith isn’t giving tours, his still-agile fingers are tying and “whipping” fancy lines for the ship—a skill that must also be “in the genes.” “I’m pretty good with my hands,” admits Smith, who says his mother was a seamstress and used to let him use her pedal-operated sewing machine. Over a century old, the iron workhorse still operates today. But you might say Smith is a workhorse himself; when he’s not at the waterfront, he’s restoring broken chairs and making birdhouses and feeders. He’s a bit of a Doctor Doolittle, too. “I’ve had scrub jays come in, and I’ve worked with them and finally gotten them to the point where they were eating off my lap,” he chuckles. His names for two of the blue-crested characters are Gus and Asparagus. Speaking of vegetables, you can add gardening to the list of Smith’s talents. The sunny spot off his deck boasts rows of peas, carrots, basil and other favorites.